1863 Chalon Issue on Thick White Paper, Imperforate & Perf. 13, Unwmkd. 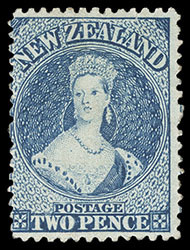 New Zealand, 1863 Queen Victoria "Chalon Head", 2d dull deep blue on thick soft white paper, imperf, unwatermarked, unused with small part o.g., full to large margins, bright color, light stain at right (not mentioned) and thins at foot, a Very Fine appearing example of this rare unused stamp, Vestey, Spink, October 2010, lot 473; with 2007 B.P.A. certificate. Scott No. 26a. Campbell Paterson No. A2h. SG No. 96 £3,750 ($4,930). 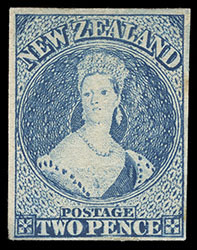 New Zealand, 1863 Queen Victoria "Chalon Head", 2d dull deep blue on thick soft white paper, imperf, unwatermarked, clear to large margins, beautiful bright color with a clear impression, lightly cancelled by partial barred oval; trivial thin spot, fresh and Very Fine appearance. Scott No. 26a. Campbell Paterson No. A2h. SG No. 96 £800 ($1,050). 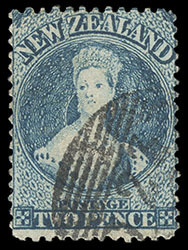 New Zealand, 1863 Queen Victoria "Chalon Head", 2d dull deep blue on thick soft white paper, imperf, unwatermarked, clear to huge margins showing value tablet of stamp at top, strong color and impression, tied by numeral "11" barred oval, matching "Napier, OC-9, 63" cds backstamp on local drop cover to Hawkes Bay, Very Fine and choice local use; with 1994 B.P.A. and R.P.S.N.Z. certificates. Scott No. 26a. Campbell Paterson No. A2h. SG No. 96 Estimate $500 - 750. 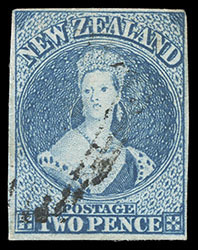 New Zealand, 1863 Queen Victoria "Chalon Head", 2d dull deep blue on thick soft white paper, perf 13, unwatermarked, o.g., hinge remnant, bright color and paper, thin spot and small tear at top, fresh and F.-V.F. appearance; with 2001 B.P.A. certificate. Scott No. 26. Campbell Paterson No. A2h (Z). SG No. 96a £2,000 ($2,630). 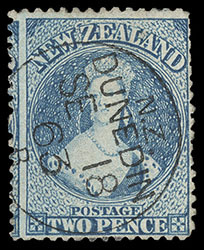 New Zealand, 1863 Queen Victoria "Chalon Head", 2d dull deep blue on thick soft white paper, perf 13, unwatermarked, beautifully centered with wide margins, bright color and paper, sharp central strike of "Dunedin, SE 18 '63" cds, Very Fine and choice. Scott No. 26. Campbell Paterson No. A2h (Z). SG No. 96a £475 ($620). 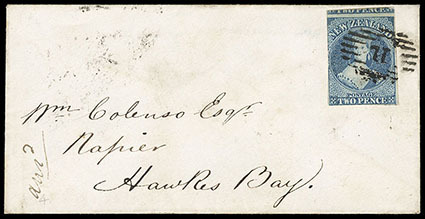 New Zealand, 1863 Queen Victoria "Chalon Head", 2d dull deep blue on thick soft white paper, perf 13, unwatermarked, nicely centered, strong color, bold "O23" barred oval cancel, Very Fine; with 1987 P.F. certificate. Scott No. 26. Campbell Paterson No. A2h (Z). 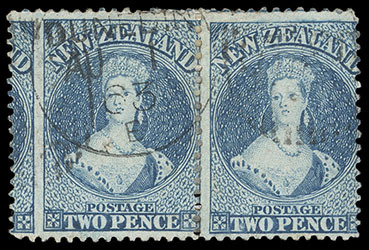 New Zealand, 1863 Queen Victoria "Chalon Head", 2d dull deep blue on thick soft white paper, perf 13, unwatermarked, horizontal pair, perfs shifted left showing large portion of stamp at left, cancelled by "Dunedin AU 1 63" datestamp duplex, separations between hinge reinforced, F.-V.F. and rare used multiple. Scott No. 26. Campbell Paterson No. A2h (Z). SG No. 96a £950 as singles ($1,250). 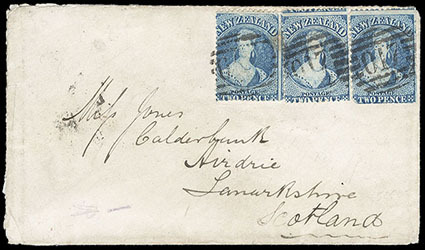 New Zealand, 1863 Queen Victoria "Chalon Head", 2d dull deep blue on thick soft white paper, perf 13, unwatermarked, three singles, each cancelled by "017" barred oval, "Tuapeka, Otago, DE 15, 1863" origin backstamp on cover to Airdrie, Scotland, reverse with red Dunedin (12.17) transit cds and Airdrie (2.19) arrival; edge wear, stamp with small flaws, lifted and hinged in place, Fine and rare franking, John Woolfe, Spink, October 2006, lot 212. Scott No. 26. Campbell Paterson No. A2h (Z). SG No. 96a Estimate $1,000 - 1,500. The first major New Zealand goldfield was found at Tuapeka in 1861 leading to the first New Zealand Goldrush.